When the British chose Delhi as their capital in 1911 they appointed two architects, Sir Edwin Lutyens and Sir Herbert Baker, to plan and build a new city to rival the fabled cities of the Mughals. New Delhi was thus built in true colonial style with tree-lined avenues, colonial bungalows, the Parliament House, the War Memorial Arch and the Viceregal Palace, now the official residence of the President of India. Alongside these British architectural gems are several older monuments commemorating much earlier occupants of Delhi including the Emperor Humayun and the Muslim saint, Nizamuddin Auliya. Indigenous Indian monuments include Jantar Mantar, the observatory built by Raja Jai Singh of Jaipur, and the Birla Mandir, a modern marble Hindu temple. Like Rome, Delhi is an eternal city. Not only is it the capital of modern India, it has been the capital of at least seven previous civilizations, and each have left behind a trail of monuments. It’s also a very green city, criss-crossed by wide, leafy boulevards; and it’s the country’s cultural heart and political centre. In addition, Delhi is known as a gastronome’s pleasure garden and a shopper’s paradise. At the centre of New Delhi stands the 42 meter (150 feet) high India Gate, an “Arc-de-Triomphe” like archway on the Rajpath Boulevard. Almost similar to its French counterpart, it commemorates the 70,000 Indian soldiers who lost their lives fighting for the British Army during the World War I. The memorial bears the names of more than 13,516 British and Indian soldiers killed in the Northwestern Frontier in the Afghan war of 1919. The entire arch stands on a low base of red Bharatpur stone and rises in stages to a huge moulding. The cornice is inscribed with the Imperial suns while both sides of the arch have the name INDIA, flanked by the dates MCMXIV (1914 left) and MCMXIX (1919 right). The shallow domed bowl at the top was intended to be filled with burning oil on anniversaries but this is rarely done. At nightfall, India Gate is dramatically floodlit while the fountains nearby make a lovely display with colored lights. India Gate stands at one end of the Rajpath boulevard, and the area surrounding it is generally referred to as ‘India Gate’. Surrounding the imposing structure is a large expanse of lush green lawns, which is a popular picnic spot. One can see crowds of people moving about the brightly lit area and on the lawns on summer evenings. Rajpath, which means King’s Way, is a ceremonial avenue used during Republic Day every year. 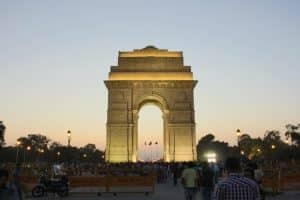 It is centrally located in Delhi and stretches in direction from east to west and from Rashtrapati Bhavan through Vijay Chowk and India Gate. Shams-ul-Din Iltutmish, of Turkish origin, was a slave of Qutb-ud-din Aibak and later became his son-in-law & close lieutenant. He then acceded to the throne of the Delhi Sultanate in 1211 and remained the ruler until his death in 1236. He was the third ruler of the Mamluk dynasty of Delhi. The tomb was built in 1235 AD. The tomb has three entrances – North, South & East. The west wall faces towards Mecca, the upper chamber of the tower opens up to the sky and the squinches on the top suggest that there may have been a dome in existence here at some point. The gates of the tomb are wonderfully carved and the precision & detailing on them remain unmatched. The intricate carvings could not be replicated until the late 19th century. The exteriors are plain and stark in comparison to the interiors, which are lavishly adorned by designs, epigraphy & religious texts. Various geometric designs adorn the western Mihrabs (niches) but the highlights are the inscriptions of the Kufic, Tughra & Nakshi scripts that illustrate chapters from the Quran. The blend of Hindu & Islamic art can be easily observed by studying the carvings of the Hindu motifs. Beautifully carved lotuses, tassels, diamonds & bells on chains add to the charm and magnificence of the monument. The walls of the monument throw light on the rich cultural history that Delhi is a part of. The Qutub Minar, touted as the world’s tallest brick tower. It is a red sandstone and marble minaret (a tall slender tower, typically part of an Islamic mosque, with a balcony from which a muezzin calls Muslims to prayer.) It is made of red sandstone and marble, a 73 meter (240 feet) tall tapering tower of five storeys, with a 14.3 meter (47 feet) base diameter, reducing to 2.7 meters (9 feet) at the peak. It contains a spiral staircase of 379 steps. The minar was built in 12th century, with restorations in 16th and 19th century. The minar tilts just over 65 cm (26 inches) from the vertical. The brick structure has been leaning to one side due to its weak foundation being further weakened by rainwater seepage. Though the minaret tilts just over 65 cm (25 inches) from the vertical, it is still within its safety limits. The government has taken measures to make the base water-tight to better preserve the monument. The minar is surrounded by several historically significant monuments of the Qutub complex. The Parliament of India is also known as the Sansad bhawan located in New Delhi and is basically bicameral in nature. The Parliament house is segmented into two houses – Lok Sabha and the second one is Rajya Sabha. The Parliament House (Sansad Bhavan) is a circular building designed by the British architects Sir Edwin Lutyens and Sir Herbert Baker in 1912–1913. Construction began in 1921, and in 1927 the building was opened as the home of the Council of State, the Central Legislative Assembly and the Chamber of Princes. Visitors are not allowed inside, however when the house is in session visitors may enter and watch the proceedings.